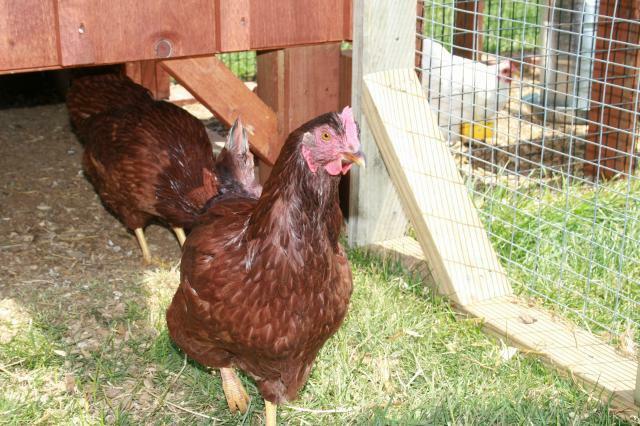 Wishy and Ishy - Rhode Island Reds - 28 weeks - no eggs yet. Now 30 weeks...We are laying!!! 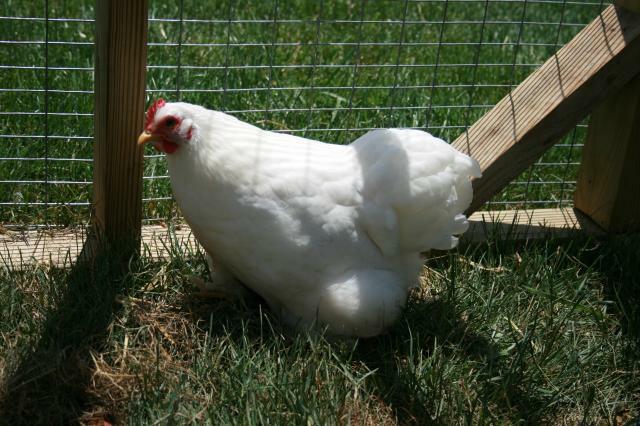 Nema - Americauna (EE) - 28 weeks - No eggs yet - she is low on the pecking order. She had her tail feathers pecked. : ( We built a bigger run and removed the culprit (Do-See-Do) for a week and it has helped. 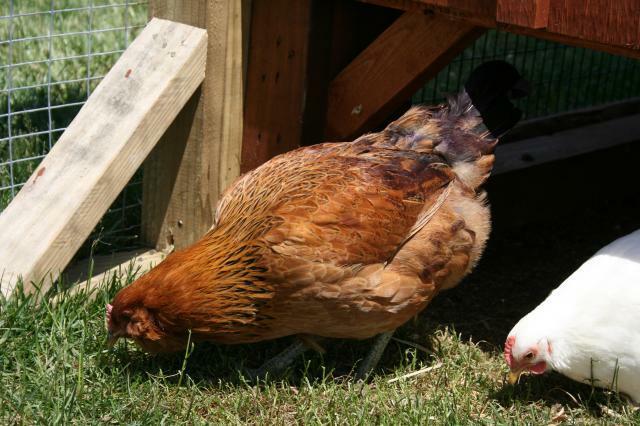 Nema isn't as friendly as the other chickens and is afraid of her own shadow. We pay her lots of attention and make sure that we put treats in another part of the pen just for her. She seems to be sticking up for herself a little more now. We hope her tail feathers grow back soon. As you can see...she has a lovely coat of Blu-Kote on her back. This is what our coop looks like. We had to put a larger run with a people door on after we quickly realized that the run it came with was not nearly large enough. 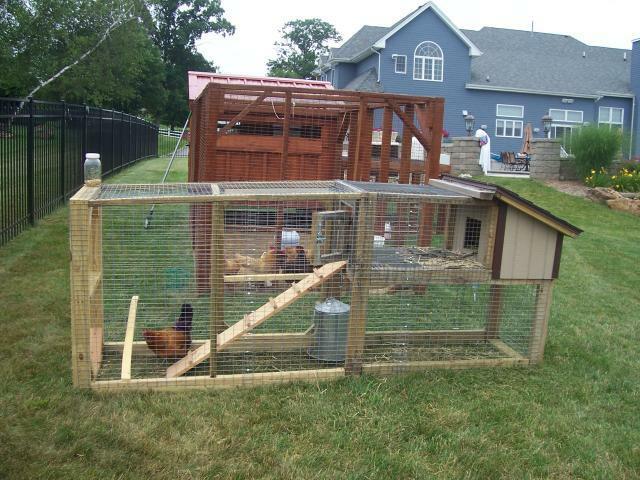 We also add two roosts in the large run, and one roost in the smaller run. 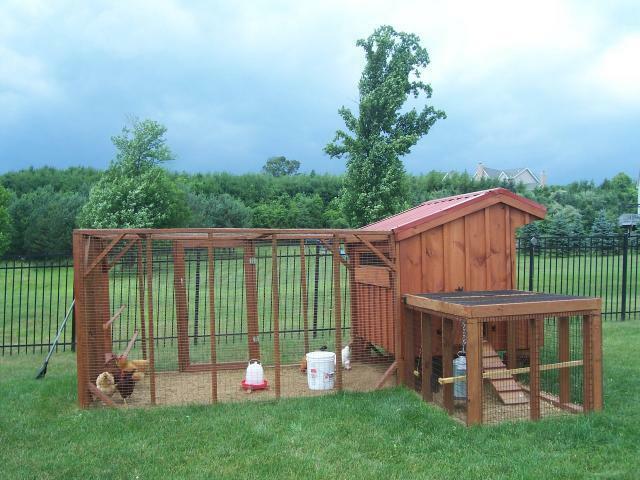 The coop is 4 x 6, the smaller run is 5 x 4, the larger run with people door is 6 x 12. 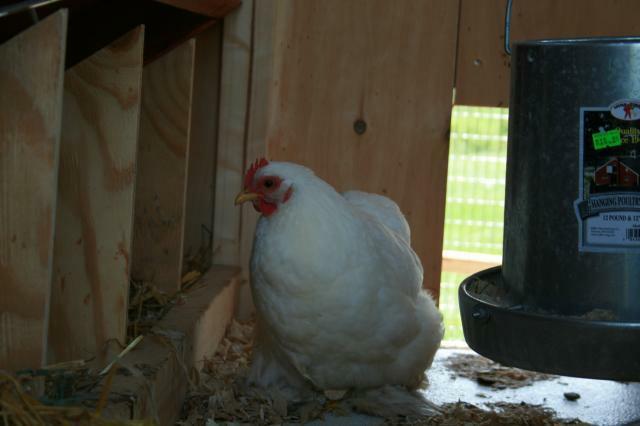 The area under the coop is enclosed so the chickens can go from run to run just by going under the coop. The area under the coop provides a cooler shady area. 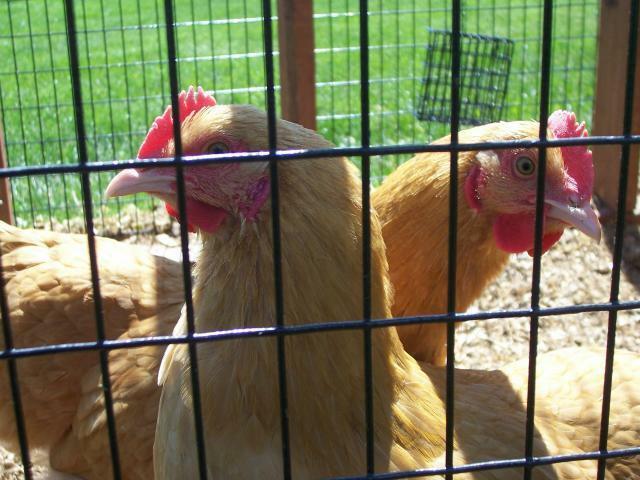 We give the chickens some free range time later on in the evening when we are out there to watch them. 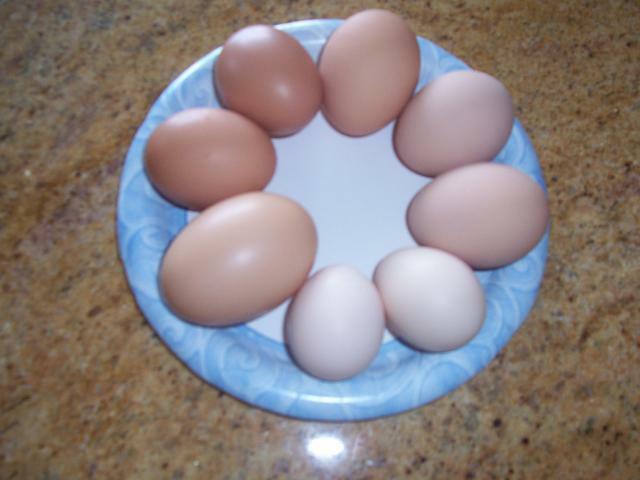 Today (6/7/10) all our chickens layed an egg for the first time. We were waiting on the last girl to lay...our Americauna (EE)...We were surprised that she did not lay a green/blue egg. 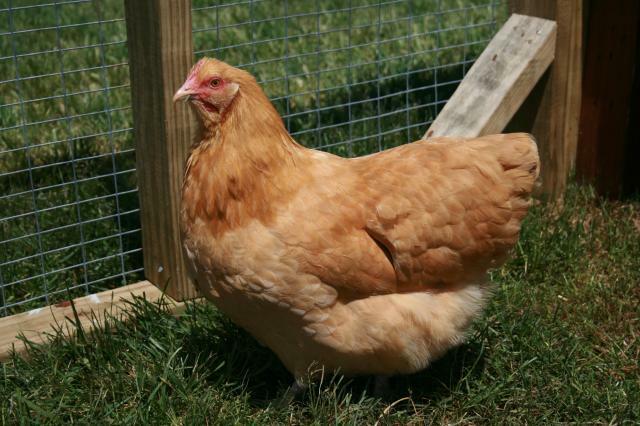 She layed the largest egg that is a golden color. We were a little disappointed that our egg box won't have a colorful egg...but, it is a great looking egg even if it isn't green/blue. Anyway...all girls accounted for and laying.